Gibault Catholic High School graduate Zach Neff was selected in the 31st round of the Major League Baseball draft by the Minnesota Twins on Wednesday. 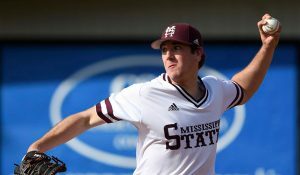 Neff, a 6-foot-1, 195-pound left-handed pitcher, played for Mississippi State University this spring, compiling a 3-2 record with a 3.46 ERA in 24 appearances, including two starts. He graduated in three years from Austin Peay and transferred to Mississippi State to pursue his master’s degree in business administration. Neff graduated from Gibault in 2014, and was named the Illinois High School Baseball Coaches Association Class 1A Player of the Year in 2013 after leading the Hawks to a state title. The drafting of Neff makes it three straight years that a Monroe County high school baseball standout has been selected by an MLB team. In 2016, Waterloo High School grad Jordan McFarland was drafted in the 36th round by the Washington Nationals but the right-handed-hitting slugger opted to play at the University of Arkansas. Last year, Columbia High School grad Josh Fleming, a left-handed pitcher, was drafted in the fifth round by the Tampa Bay Rays following a dominant season on the mound at Webster University.